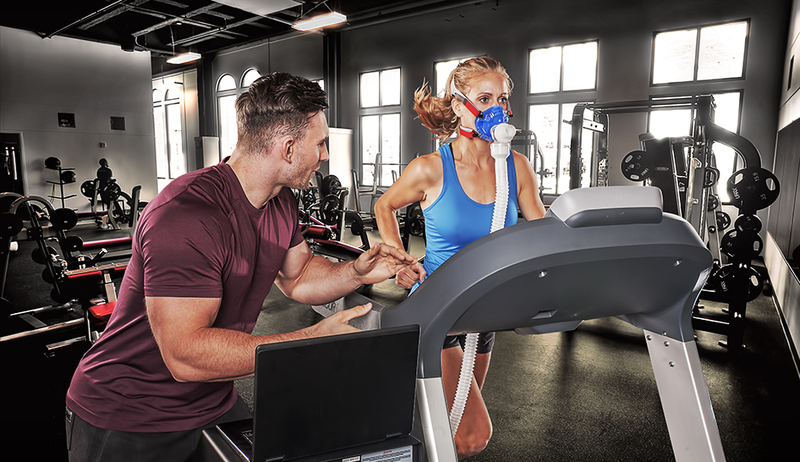 This is an IHRSA featured post, brought to you by KORR Medical Technologies, Inc.
Once available only in elite athletic facilities and medical offices, VO2 Max testing is coming to health clubs in a big way. The data-driven workout is here to stay, and those who take advantage of new biofeedback technologies are reaping the rewards. Heart rate-zone training programs, as practiced by clubs like Orangetheory, are changing the way a lot of fitness facilities are approaching the concept of fitness programming, and consumers are signing up by the millions. We truly are a long way from the days when a trainer would take your pulse after a cardio session or rely on the RPE (rate perceived exertion) scale to measure intensity. But while “zone” training has replaced familiar analog modalities, heart-rate monitored workouts can suffer from a lack of individualization. Tailoring workouts to every member’s specific physiology is the next wave of biofeedback training. Consumers are accustomed to using health measurement devices that they once only had access to in medical facilities. Blood-glucose meters are one example of a biomarker device that’s now commonplace outside of a doctor’s office. Soon, more biological data will be accessed instantly by the average person. It was only a matter of time before the biomarker boom began reaching a wider consumer population in the fitness sector. So how do you take advantage of this trend now—and in a way that’s affordable to you and your members? These digital tools usually come in the way of wearables or digital trackers: smart watches, heart-rate monitors, Fitbit devices, etc. And these are often accessible through apps that are wirelessly connected to cardio equipment. But data can be just noise if it’s not analyzed and put to good use. This was the idea behind Wearables 2.0, where clubs began creating programs to integrate new consumer technology into their fitness programming. It goes to reason that heart-rate training as we know it today will give way to more exact biomarkers. Heart-zone calculations on cardio equipment and wearables are based on population averages. This is where zone training lags behind more precise feedback tools, such as VO2 Max training. Problem is, measuring VO2 MAX hasn’t traditionally been cost-effective or practical for the everyday health club, and instead reserved for elite athletic training centers. But that’s changing, and clubs adopting new VO2 Max technologies are getting dramatic results. Anaerobic Threshold (AT). This is an endurance marker that determines when your body no longer uses oxygen efficiently and lactic acid begins to accumulate in your muscles. This is a crucial data point for reaching a number of different exercise objectives, from weight loss, strength training, and endurance. Respiratory Exchange Rate (RER). This is the specific heart rate where your body most effectively burns fat, and can be used to create powerful weight-loss routines. Resting Metabolic Rate (RMR). This is the number of calories required by a person to fuel their body at rest. It is measured by testing oxygen uptake while the client rests. With these metrics, VO2 Max test can tell you the precise heart rate for an individual to successfully reach their goals, whether they’re everyday exercisers or elite athletes. Studies show that sedentary subjects who train at 75% of aerobic power for 30 minutes, three times a week over six months increase VO2 Max an average of 15-20%. Those are huge improvements. And with programs matched up with VO2 Max results, clients can exercise more efficiently with less carry-over fatigue and fewer injuries. VO2 Max test can also tell you the precise number of calories burned during every level of exercise. With weight-management a primary goal of members, this is a critical metric for success. Those who recognize the revenue potential of zone training are turning their attention to VO2 Max testing. Once prohibitively expensive, VO2 Max technologies are now available to clubs at cost-effective pricing. One company leading the way is KORR Medical Technologies, Inc., who offer the CardioCoach line of VO2 Max testing systems for health clubs. It’s a must for those facilities who offer performance training, but it’s also become a key retention driver for those clubs who know how to use the technology to help the everyday member get better results on a more time-efficient program. What makes the CardioCoach feasible for everyday health clubs is KORR’s “Mixing Chamber Technology.” Known as the “gold standard of cardiopulmonary exercise testing,” this system increases the precision of VO2 Max measurements, while also making the results of the test easy for fitness professionals to use to create a successful exercise program. KORR offers three different versions of the CardioCoach: the standard CardioCoach, the CardioCoach Plus, and the CardioCoach CO2, each of which delivers different levels of feedback data. All three models are simple to operate, so you don’t need sophisticated training sessions to use them. The CardioCoach is self-calibrating, and comes with software preloaded with plans matching up with clients’ test results and fitness goals. KORR also doesn’t lock you into service agreements or expensive mask contracts so you can keep costs low. For more information, visit KORR’s website and learn about their other breakthrough technologies for health clubs. And if you’re attending IHRSA 2018 in San Diego on March 21-24, stop by the KORR trade show booth for a demonstration of the CardioCoach.